Having in mind the anxieties experienced in the recent reign of Grand Master Ximenes, with the unrest of the native Maltese population in the Revolt of the Priests, The newly elected Grand Master convening a Chapter General in 1776, called for the establishment of a new regiment. It was to be recruited as a ‘foreign legion’ to protect the Order against internal enemies, and it’s formation of the regiment was based on that of a French regiment of the line. Notwithstanding the efforts, the Grand Master had to experience a great disappointment on the formation of the Regiment. It was anything but a success. According to plan, 1200 men were enlisted overseas in Avignon, Corsica and Marseilles. This recruitment, though it cost the Treasury an enormous amount, was conducted in so careless a manner that instead of producing soldiers on whom the safety of the State could rest, it only produced deserters, vagabonds and scallywags picked up in all ports of the Mediterranean. 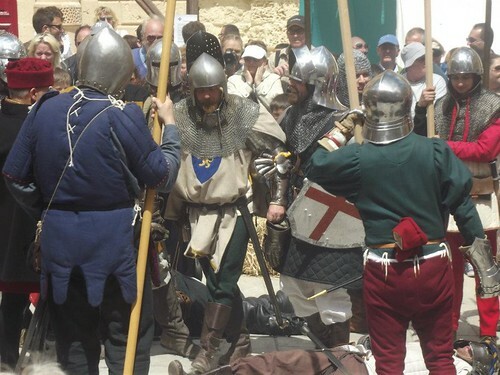 A new commander was appointed and obtained the permission of the Congregation of War to allow him to recruit native Maltese. At the end of four or five years, this brave Knight had at length the satisfaction of seeing this regiment as well composed, trained and disciplined as any French regiment. On the eve of the French invasion the Regiment of Malta was some 500 strong. Numbered detachments defended Fort Tigne, Fort St.Angelo,Fort Ricasoli and Fort St.Elmo. The larger garrison, of Fort St.Elmo was ordered to man the bastions of Valletta and Floriana. The garrison defending Fort Tigne held on to their posts and resisted all attacks directed against them. The Regiment’s soldiers at Valletta took part in a disastrous attempt at attacking the French forces encircling the city. Those at fort Ricasoli and Fort St.Angelo only surrendered after the capitulation was signed. When the French took over the island men from this regiment were pressed into service of the French army and took part with the Legion Maltaise in the invasion of Egypt.